Pagan philosopher who converted to Christianity at age 30 by reading the Scriptures and witnessing the heroism and faith of martyrs. He used his philosophical and oratorical skills to publicly dispute with pagans and explain his new faith, and he became one of the first great Christian apologists. He later opened a school of public debate in Rome, Italy. All this high profile Christianity naturally brought him to the attention of the authorities, and he died a martyr. Third of eight children in a deeply religious family. Studied philosophy and theology at the seminary at Como, Italy. Ordained on 30 May 1863. Professor and rector of Saint Abundius Seminary. Pastor of Saint Bartholomew's Church in 1870. 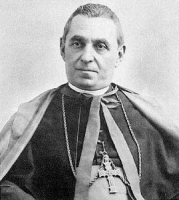 Bishop of Piacenza, Italy on 30 January 1876 at age 36. Worked with cholera victims, visited the sick and prisoners, helped the poor and bankrupt nobility. Saved thousands of farmers and workers from famine, selling his horse, chalice, and the pectoral cross that Blessed Pope Pius IX had given him in order to buy food. Founded an institute to help hearing and speech-impaired women. Organized assistance for young single women employed in rice fields. Established mutual aid societies, workers' associations, rural banks, cooperatives, and Catholic Action groups. Ordered that catechism be taught in all parishes. Planned and presided over the first National Catechetical Congress in 1889. He was convinced that devotion to religion and one's country could be reconciled in the hearts of Italians. Promoted reconciliation between Church and State, and helped solve a painful moral dilemma for Italian Catholics. He aimed at preparing this religious reconciliation on a practical level, combining religious belief and patriotic love in his work with migrants. Worked with millions of Italians forced to emigrate, often in dire conditions, always in danger of losing their faith and their attachment to religious practice. John was devoted to the Eucharist and spent hours in adoration before the Blessed Sacrament, to Our Lady, preaching many Marian homilies, and making Marian pilgrimages. His last conscious words were, "Lord, I am ready, Let us go". 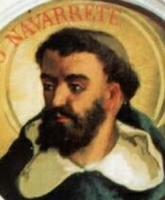 Third of four children of Francis the Marquises of Saint Catherine of Jonio, a Papal Vice-Consul, a knight, and Honorary Captain of the Navy; his mother was Anna Toscano, an Italian aristocrat. His father died when Hannibal was fifteen months old. The boy developed a devotion to the Eucharist and the Virgin Mary. At age 17, while in prayer before the Blessed Sacrament, he received a call to religious life. Ordained 16 March 1878. Immediately after he moved into the Avignone ghetto, one the most impoverished areas he could find, and began a life's work with the poor. In 1882 he founded the Anthonian Orphanages, so-called because they were under the patronage of Saint Anthony of Padua; they were noted for their operation as an extended family. In order to expand this work to a much larger sphere of physically and spiritually poor he founded The Daughters of Divine Zeal in 1887, and The Rogationists in 1897; they were canonically approved on 6 August 1926. He believed in the need for a strong priesthood; he started the Holy Alliance and Pious Union of the Evangelical Rogation, worldwide movements of prayer for vocations, and published the periodical God and Neighbor with information about these movements and their work. He worked to be a model for the seminarians who came to work in his schools, and cared for the physical and spiritual needs of his brothers and sisters in the religious life. He was considered a saint during his life, and received a vision of the Virgin Mary just before his death. The groups he founded continue to day, working all over the world in prayer, publishing, orphanages, schools, training for the deaf and mute, care for the aged, home for single mothers, and schools of all types. Born to a wealthy, noble Piedmont family, his reading of the Gospel caused him to abandon position for a simple life. Cobbler in Alba, Italy. Theobald proved himself a skillful craftsman, and his master hoped that the young apprentice would marry his daughter and carry on the business. Theobald, however, had made a private vow of chastity, and abandoned the trade. Following a pilgrimage to Compostela, Spain, he worked as a porter, spending his day carrying sacks of grain. He gave away as much of his wages as he could to people even more poor than himself, and there are ballads about him in which he gave away the grain and flour he was supposed to deliver. Venerated in Liguria and the Piedmont regions. Educated at Oxford. Doctor of law. President of Broadgate Hall (modern Pembroke College) form 1537 to 1539. First Regius Professor of civil law. Married in 1547. Member of the English Parliament in 1547. Opposed anti-Catholic laws enacted by King Edward VI. Imprisoned from 1548 to 1550 for opposed the Bill of Uniformity. On his release, he and his family moved to Leuven, Belgium, but returned to England in August 1553 when Catholic Queen Mary ascended to the throne. Chancellor to Bishop Edmund Bonner. Member of Parliament again from 1553 to 1560. In 1560 he opposed the Bill of Supremacy, and incurred the ire of Queen Elizabeth. Imprisoned in Fleet Prison on 20 May 1560, he escaped, was captured at Marshalsea, and re-imprisoned. Escaping again, he fled the country to Antwerp, Belgium. There he renounced his English citizenship, and became a subject of the Catholic Spanish crown. Customs official in Flanders. Kidnapped at Bergen-op-Zoon by agents of Queen Elizabeth in August 1570. Returned to England, he was locked in the Tower of London and repeatedly tortured. Indicted on 26 May 1571 for conspiring against the Queen's life. Throughout his misery, John claimed his innocence, and the court's lack of jurisdiction over him, a Spanish subject. Condemned on 27 May 1571. Martyr. Imperial Roman soldier. Convert to Christianity. During the persecutions of Diocletian, Crescentinus fled to Thifernum Tiberinum (modern Città di Castello). There he is reported to have slain a dragon that had terrorized the region; this convinced the locals of the power of God and led to many conversions, and to the depictions of Crescentinus fighting a dragon. It is also possible that Crescentinus evangelized the region, made many converts, and the image of him slaying the dragon is represents him defeating the devil or paganism. Eventually, however, the anti-Catholic forces of Diocletian came to the area, and Crescentinus fell as a martyr. Son of a wealthy merchant, John cared nothing for business, wealth or worldly success and preferred to live as a hermit. He eventually felt a call to help the poor and sick in the world, and gave away food, clothes and wealth, going hungry, living in rags, wearing a rope around his neck to indicate that he was a sinner in need of punishment, and falling into lengthy ecstasy. His family worried about his health, both physical and mental, and they had to bring him in from the street. 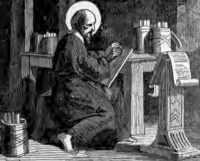 He became a Franciscan tertiary, and with the support and discipline they provided, he was able to properly devote his life to prayer and charity. His father was Greek, his mother Calabrian. Educated in Constantinople. Pilgrim to the Holy Lands where he supported himself by serving as tour guide to other pilgrims. Spoke Greek, Latin, Coptic, Syriac and Arabic. Monk in Bethlehem. Deacon. Hermit beside the River Jordan. Monk in Bethlehem. Hermit on Mount Sinai. Sent to seek alms from the Duke of Normandy for the support of other hermits on the mountain. Hermit near Trier, Germany under the direction of the abbot of the nearby Benedictine monastery of Saint Martin. One of the last great figures linking the Orthodox West with the Orthodox East. Dominican priest. Missionary to the Philippines in 1578. In 1610 he returned to Europe to recruit missionaries, and in 1611 returned to the Orient as missionary and Dominican provincial vicar in Japan. His evangelism work brought many hundreds to Christianity. Martyr. Bishop of Ossero, Istria (in modern Croatia) in 1030. Falsely accused by some of the nobility who objected to his spiritual reforms, Guadentius travelled to Rome, Italy in 1032 to defend his name. On the way home, he fell ill in Ancona, and stayed there to recover. He then resigned his see, and became a Benedictine monk under Saint Peter Damian. Prince of Mercia, the son of Wigmund of Mercia and Aelfflaed, daughter of King Ceolwulf I of Mercia. Killed in his youth by his regent Bertulph, king of Mercia, for opposing the marriage of Bertulph to Wistan's mother. Some writers have considered him a martyrs. Priest in the diocese of Moulins, France. Canon of Moulins. During the French Revolution he was arrested and sentenced to forced labour for the crime of being a priest. Imprisoned on a ship anchored off shore, he was tortured repeatedly, starved and left to die. One of the Martyrs of the Hulks of Rochefort. Hermit. Monk at San Juan de Peña, Aragon (part of modern Spain), and later served as prior. Hermit in the Aragon mountains. Reforming abbot at the monastery at Oña, Spain in 1029 at the request of King Sancho the Great. Known as a peacemaker and miracle worker. Evangelizing bishop. Missionary to Gaul with Saint Paulus of Autun and ten companions whose names have not come down to us. Bishop of Autun, France, which formed the base of operations for the group. They were all martyred by order of Emperor Aurelian who was at war with the locals at the time. Christian peasant farmer in the apostolic vicariate of Central Tonkin (modern Vietnam). During the persecutions of emperor Tu-Duc, he was ordered to step on a crucifix to show his contempt for Christianity; he refused. Imprisoned, tortured and executed. Martyr. Augustinian priest in 1603. Missionary to Mexico. Missionary to Japan. Augustinian vicar provincial in 1605. Worked with Blessed Alphonsus Navarette. Martyr. Martyred by pagan Danes. There is a holy well devoted to her at nearby Morcombe Lake. Evangelizing priest. Missionary to Gaul with Saint Reverianus of Autun and ten companions whose names have not come down to us. Worked from Autun, France. They were all martyred by order of Emperor Aurelian who was at war with the locals at the time. An early missionary bishop, ordained by Saint Patrick, who preached in Cornwall, England, and in Brittany, France. Born to a noble Swabian family. Nephew of Saint Anno. Bishop of Trier, Germany, which involved him in the political fight over who had the right to choose the bishop of that diocese. On his way to Trier he was captured by opponents and murdered. Considered a martyr. Mercedarian friar. Professor in a medical school in Montpellier, France. Preacher and writer who made expeditions to ransom Christians who had been enslaved by Muslims. During one of these trips he was imprisoned and beaten daily by Muslims for adhering to Christianity. Martyr. Steward and servant of an Alexandrian magistrate in Roman imperial Egypt. During the persecutions of Decius, Ischyrion's employer demanded that he renounce Christianity and sacrifice to pagan gods. When Ischyrion refused, the magistrate ordered him beaten and martyred. Hermit in Provence and Lerins, France, and in Greece. Friend of Saint Honoratus of Arles and Saint Venantius. 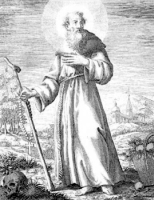 With Saint Honoratus, he founded a monastery at Lerins, and eventually served as its abbot. Layman catechist in the Archdiocese of Nagasaki, Japan. Martyr. Fifth-century parish priest in the village of Territet near Spoleto, Italy. Famed for his love for the poor, his gentleness as a pastor, and as a miracle worker. 1) He was a priest in Patras, Greece. With Saint Regulus of Scotland, he came to the west with the relics of Saint Andrew the Apostle. 2) He was a priest in Scotland who received Saint Regulus of Scotland and helped him enshrined the relics of Saint Andrew the Apostle. Student of Saint Pamphilus of Alexandria; fellow student with Saint Porphyrius of Alexandria. 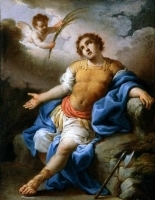 Seleucus applauded how strong and calm Saint Porphyrius remained under torture; this exposed him as a Christian, and he was martyred. Cistercian monk at the monastery in Haina, Germany where he served as cellar-master for 16 years. Born to Christian parents. Dominican tertiary. Helped the friars with their missionary work, and was martyred for it. An officer in the Imperial Roman army. Martyred in the persecutions of Diocletian. Imperial Roman soldier. Martyred in the persecutions of Decius. Evangelizing bishop in the Aquitaine region of modern France. Martyr. Monk in Ruthenia (in modern Ukraine). Physician who did not charge for his services. Student of Saint Pamphilus of Alexandria with whom he was tortured and martyred. Martyred in the persecutions of Emperor Alexander Severus. Benedictine monk at Ona, Old Castile, Spain. Spiritual student of Saint Enneco. Bishop of Oca-Valpuesta, Spain. Founded the Order of the Hermits of Saint Jerome in Italy. The patron of a church and a healing well in Ciwyd, Wales. Carthusian monk in Capella, Belgium. Monk in Ruthenia (in modern Ukraine). Monk. Abbot of Lismore Abbey. Scourged and executed in the persecutions of Emperor Maximian Herculeus. Martyr. Mid-fourth-century bishop of Vienne, France. A group five of imperial Roman soldiers assigned to guard a group of Egyptian Christians who were imprisoned for their faith in the persecutions of Decius. During their trial, they encouraged the prisoners not to apostatize. This exposed them as Christians, were promptly arrested and executed. Martyrs. Their names are - Ammon, Ingen, Ptolomy, Theophilis and Zeno. Three Christians martyred together in the persecutions of Galerius. We know little more about them than the name - Paul, Valens and Valerius. Five foot soldiers and their commander who were martyred for their faith by order of the imperial Roman prefect Arriano during the persecutions of Decius. A group of spiritual students of Saint Justin Martyr who died with him and about whom we know nothing else but their names - Carito, Caritone, Evelpisto, Ierace, Liberiano and Peone.